Bali smells good, it tastes fantastic and offers epic views. But I didn’t get this special feeling yet, everyone is talking about. Many Bali visitors talk about the special energy on this island. I came here to explore Yoga in Bali, the community and the energetic vibe of the island. 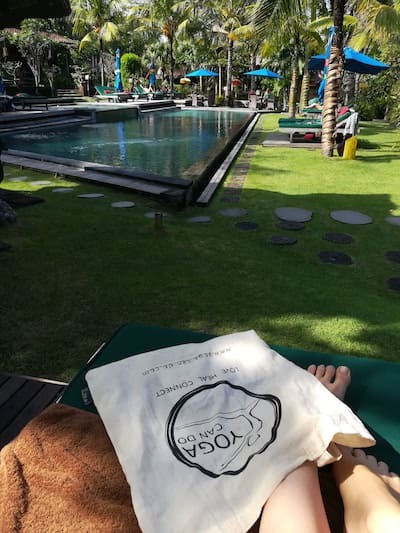 Is it true Yoga in Bali or just an international modern vibe of vegan yogis and first world nomads? I gonna spend four weeks here. Mainly I stay in Canggu, Ubud and Gili Islands. Every week I leave you a report about my latest experiences and impressions. Enjoy reading and write your message in the comments! After an 24 hours traveling I arrived at Denpasar airport. Of course my first day started with an overpriced taxi drive and a credit card lost in the machine (!!! in Bali first comes the money, then the card). But no pasa nada: costly taxi driver was very friendly and giving me a free intensive class of balinese language and culture. And I also got my credit card back without problems. 1,5 hours later I arrived at Desa Seni, a village resort, a true paradise on earth. It’s the very first place in Canggu offering Yoga. That was ten years ago, when there were only rice fields and stunning views. Now you find new roads, buildings and many traffic around this area. But Desa Seni kept their haven planting many trees and plants to close it from outside busyness. I attended as many Yoga classes as I could – with four different teachers. The classes were all well rounded. And I got the feeling that all of them are truly connected to what they teach (more about my yoga experience at Desa Seni will follow soon). Desa Seni is really what you can call paradise on earth. They couldn’t make your stay more enjoyable. Room service was coming three times a day. First to open the windows in the morning. Second to put the day bed cover and organize the room (they even put my tooth brush into the cup). And third in the evening to close everything and prepare the bed for night rest. There’s really nothing you have to worry about, unless you like to close the windows on your own (which is truly difficult because of the huge wooden frames). At this place you forget all your worries and enjoy yoga and spa treatments. I’ve felt like the only thing I had to do is eating and walking from one wonderful yoga class or spa treatment to the restaurant and back. But for me it was a little bit too much of idyllic wellness world. And I asked myself where’s the yogic humbleness and simplicity in it? How to practice humbleness if you get your bed made twice a day? In general I got the impression that eastern origins of Yoga got a bit lost between western minded teachers and american yoga students in their trendy colored yoga pants. I guess schools and teachers also try to fulfill the guest’s expectations. At the end of the month somehow you need to earn your money. Not a big difference to western world’s Yoga industry. Classes’ occupancy was more or less what I am used to from Europe or U.S. Vinyasa and bodily demanding yoga styled classes were full. When I attended Pranayama, Meditation or Bhakti Yoga class, I almost got a private lesson. Is Yoga becoming a product of first world colonialism? When I made my way up to the north on a 3,5h car drive I had plenty of time watching the balinese landscapes and scenery. And I sadly say: Hello capitalism. It’s not as bad as what I’ve seen in India. But I guess it’s matter of time. Between green rice fields and balinese temples you find the rivers and roadsides stuffed with plastic waste and garbage. Capitalism and industrial world also pollutes this part of Asia. And neither people nor the country is ready to respond. Missing infrastructure and environmental education is helping that people simply throw their rubbish in the next corner or in the river without realizing the consequence for their nature and health. Instead of pushing the Yoga industry, yoga instructors should remind students of the simplicity and humbleness Yoga can teach us. Yoga means union. It’s a tool to connect to the the whole, to universe and nature. Through Yoga we can experience this union and feel oneness. This is the consciousness we need to create. In order to unify. Not causing more damage to the world, feeding the ego with expensive Yoga accessories. 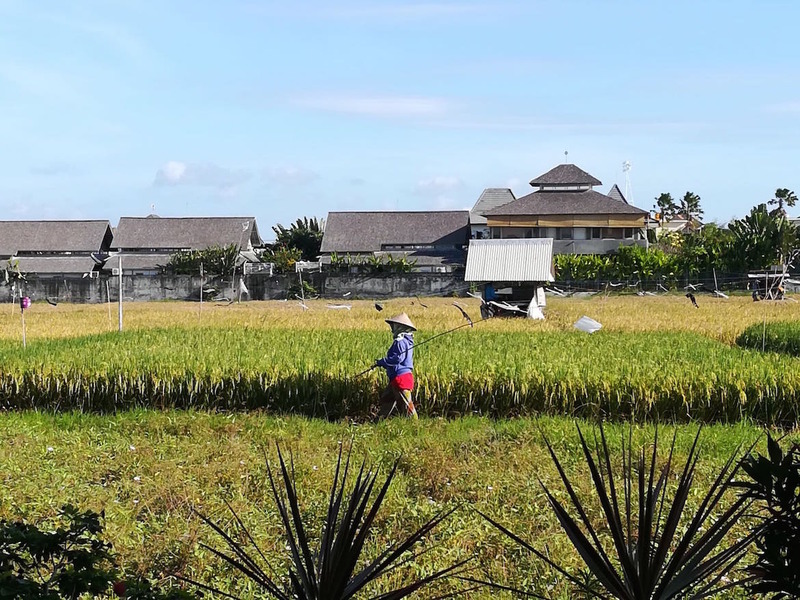 My first impression in Canggu: there are two worlds. The international community full of digital nomads, entrepreneurs and hipsters. And hidden ancient Balinese culture, cultivating rice fields and providing the business with their countries treasures. After a short trip to the north attending my friend’s wedding, I am back in Canggu right now. Today I was very happy to meet Yuni and Mano Hara from Pranava Yoga. A german yoga student I met at Desa Seni told me about that place: “They have only local teachers“. That made me curious. I had to know this place. So I sent another request to meet them and talk about Yoga. And got a Yes. Pranava is a haven of tranquility and authenticity, located behind Yunis family’s house and rice field. Yuni’s father already constructed the Yoga Shala only for personal use. A place where people can come and practice Yoga. Later his daughters started to offer Yoga classes to the public. They wanted to spread Yoga especially to the balinese community, still offering free classes and reduced prices. Yuni was very kind and humble. She told me to speak with Mano Hara, their most experienced teacher at Pranava Yoga. He follows the studies of an Indian master. Finally I found the true Yoga philosophy I was looking for. He also could answer my questions about the Yoga origins in Bali. 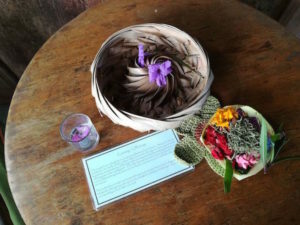 What he answered and more about Pranava Yoga in Canggu I will tell you in an separate article. After my first week here in Bali, having got just a small insight of Bali’s Yoga world, I have an ambivalent feeling. And it makes me miss India. Right now I have the feeling, that I will spend an exciting trip here in Bali, researching and learning a lot. But concerning Yoga, nothing compares to India. Coming back to this magic energy people talk about: I didn’t get it yet. I see so much incoherency and separation that I couldn’t really say that Bali has a special transformational energy that changes your life. But who knows…It was just my first week. Have you been to Bali?? You disagree? Got a different feeling about this place? You know Canggu or Ubud? Yoga places? Or simply want to recommend me a place to visit? Hello! I am glad you landed at Desa Seni! I would have been very happy to meet and wish you would have reached out. Great writing, there is one correction needed. We have 10 teachers who contribute to our program and 5 of them are Indonesians. I clarify this as part of our community Vision is to support local. Local as in staff, mgt, teachers, suppliers, organic farmers, the village, several orphanages, and aids education. A shame we did not meet so you would fully understand the passion and vision behind Desa Seni!